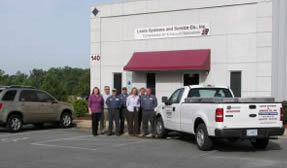 Air Compressor Rentals Raleigh, NC | Lewis Systems Inc. If you or your business are located in the Raleigh, NC area and are in need of air compressor rentals Lewis Systems, Inc., with over 30 years experience in the industry, can provide you with such quality equipment. Even though we are physically located in Rocky Mount, we serve the Raleigh area on a daily basis. We deliver your air compressor rentals 7 days a week, whether your needs are for 1-500 days. Lewis Systems rents Rotary Screw Air Compressors, Reciprocating Air Compressors, and Hitachi Air Compressors. Our products also include; Oil Flooded Rotary Screw (fixed and variable speed), Oil Free Rotary Screw, NFPA 99 Compliant Medical systems and Rotary Vane compressors. We represent the industry leaders in compressed air such as Gardner Denver, Curtis, Boge & Hydrovane. Lewis Systems also offers used air compressors as well as a full line of desiccant air dryers, refrigerated air dryers and compressed air filters. As one of the highest regarded distributors of Gardner Denver Air Compressors, Lewis Systems Inc specializes in oil free air compressors, rotary screw air compressors, and reciprocating air compressors on most major brands such as Sullair, Ingersoll-Rand, Quincy, Kaeser, Curtis, Comp-Air, Cooper-Turbo, Atlas-Copco, Joy, Travaini Vacuum Systems, Kellogg America, Leroi & others. Rest assured that Lewis Systems Inc can handle all your compressed air and vacuum needs any time day or night! Contact us for more information about our Air Compressor Rentals in Raleigh.